they give off such a heavenly scent even after they are expired. Oh Moondust – what kind comments for a budding poet from a master of words – wonderful motivation-fuel. Such a fantastic metaphor you’ve employed here!! Absolutely marvelous! It was all nature’s inspiration I’m afraid. I was just the lucky witness. The day before we visited the farm, we drove by, so I knew what incredible views were at the end of that field. Then the next morning we walked through the farm and the fog transformed it into a magical place. I suddenly realised that without the ocean view, I HAD to pay attention to what was right in front of me. It’s a bit like life, isn’t it? Paying attention to this moment is often ignored when we make plans and dream about the tomorrows. Sometimes though, it rains, or we get sick and curl up in bed, and then we notice how lovely it is right here, right now – how cozy to sit beside our own hearth and see the embers glow. ABSOLUTELY!! Paying attention has wonderful payoffs!!! No matter what!!! Oh so vivid. I more than see, I feel, when I read this. 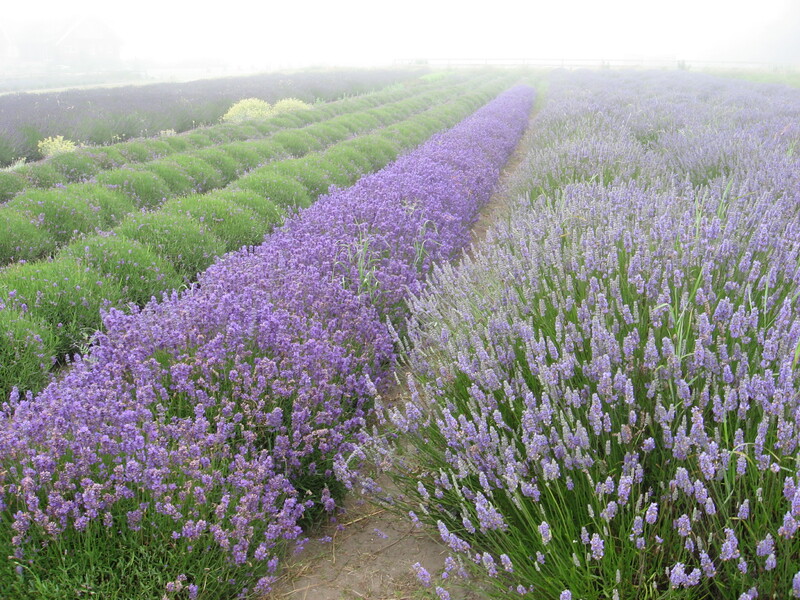 And I love the ending and the way the rows of lavender steal the mountain’s glory….and purple Prima Donnas most beautifully on the tongue. Thanks again, Christina. We, like so many other writers here on wordpress, have the poet’s love for getting as close to the image as possible and using all of our senses to gather it in, soak deep into it, then spend it with ink and words.